This afternoons iPad doodle is of fishermen pulling in their catch. My dad was a fishing guide so I have lots of boat and fish imagery floating about my head. Everything in our house revolved around fishing. I’ve been landlocked now for the last few months and Its getting on my nerves. I really miss being out in the water, especially on cold rainy days like today. Its pouring and the thermometer is hovering near 1°C. The only thing I can do at the moment is to imagine hotter weather. 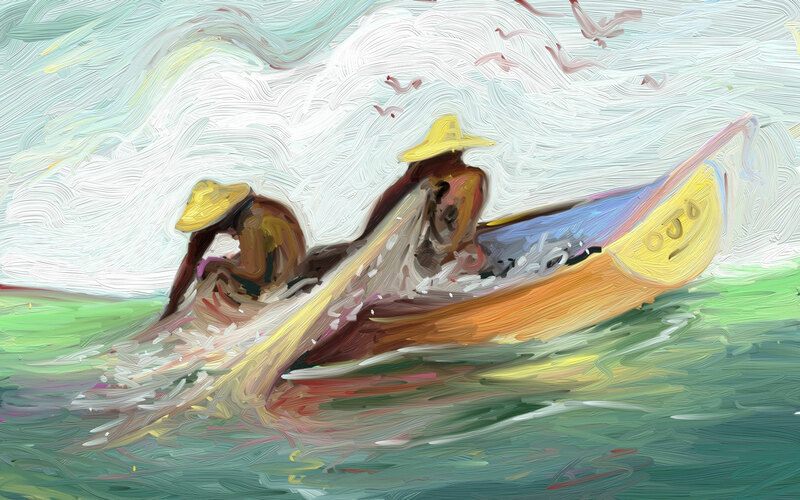 I really like your choice of colors and the movement you’ve achieved in this painting of the fishermen. I paint in oils (in the traditional way) and I’ve tried using a couple of the art apps on my iPad … Really, really Unsuccessfully!! I’ll give artRage a try and see what I come up with. Do you know if there is an app that allows a stylus-type tool for sketching in place of fingers? Sorry Deborah but I until there’s pressure sesativity for the iPad I don’t think proper sketching is realy possible. Painting only really works because it doesn’t emphasize line. I’ve heard rumor about some startups that are trying to remedy this problem by making pressure sensative stylus’. This will be a game changer if it happens. Until then it’s just fingers and rubber tipped sticks. Most of the time I use my finger, but on longer sessions I do use a Kensington stylus. It has a really small tip so it’s a little easier to see where your painting.